Suprised that this is an actual creature? Well, its true, from the film Gremlins, the Mogwai is based on an actual Chinese mythical creature known for its devious behavior and for its rampant mating seasons during rainfall. These creatures are considered a class of demons who inflict harm upon humans. These creatures breed during the rain as a sign of rich and full times ahead, hence the play on gremlins being created by water, though through asexually reproduction. The name literally means "evil beings" but in actuality, its the first syllable that means "evil" while the second mean deceased spirit, as some cultures believe mogwais are created from vengeful spirits and the early syllable is actually a variant on the term "magic", showing tha tthese "Demons" are mystical spirits of vengeance upon humans. 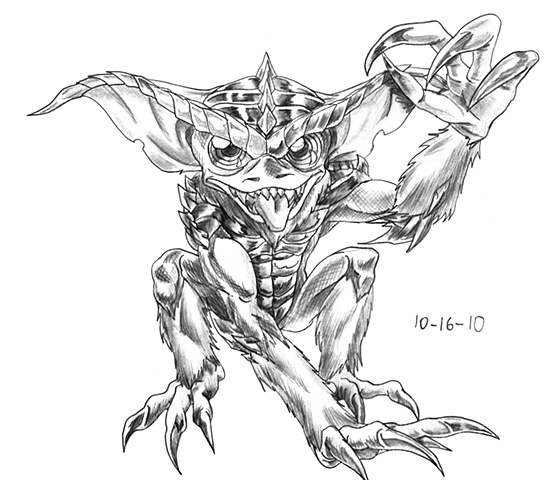 For my depiction, as a fan of the Gremlins films, I drew the mogwai as a variant of the gremlins with scaly skin, bone spikes, and caiman armor plating, while using the Gizmo inspired fur in select areas of its body. I gave it its spiral eyes as another unusal feature for this trouble maker of man. And, thus that is final version of the Mogwai. Its a fun creature to look up, and also the name of a band, but it was a fun nostalgia kick on creating a creature with a film tie-in.